Clement is a rough-and-ready type of guy. He comes from a military family, and grows up under the assumption that he will join the US Navy after he graduates. It is something of a shock to the family when he joins the Marines instead. Most of the books I review are ones I receive free in exchange for a review, and my finger surprised me when it tapped the button requesting a copy of this title from Net Galley. See, I am a Marxist. I never support an imperialist war, which means every war the USA has been involved in since the end of the American Civil War, and for me, even the horror of 9/11 didn’t change that. So why did I want to read a soldier’s memoir of Afghanistan? I hadn’t read far, once I received the book, when I realized that part of the hook for me was the journalistic black-out that has been imposed for many years, ever since the flag-draped coffins hit the front pages of local newspapers and everyone rose up for various reasons; some of them were against the war in general, and some were families of the deceased who felt it was disrespectful for their loved ones to be displayed this way. But one way or another, the Pentagon and those who stand behind it decided that this would not be another open-access war; there would be no more photographs of anything that took place in Iraq or Afghanistan in print from even the most mainstream media. It was a giant blow to the First Amendment. And now, though he was required to change a lot of details for security reasons, a Marine lieutenant has come forward to tell us about his experience there. It was as if the wizard had stepped out from behind the curtain; finally, someone was writing about the war. Many people, especially those of us on the left, get the false notion that the US military wants to round up all of our young men and send them off to fight. It isn’t quite like that, at least in this man’s experience. From among those who sign up for ROTC, there are those who are culled. Some are tossed for academic reasons; some for physical weakness or unfitness; and others simply aren’t team players. And the amount of absolute obedience and conformity that the training requires leaves no room for the free thinker, that’s for sure. Either you do it, or you’re out! I had never heard before of someone who genuinely loved every minute of his training experience. I think that part of that mindset has to be a really strong physical constitution; people who get sick easily just can’t do this. But a large part of it is also the culture, the stories that are handed down by the family, and the things he isn’t supposed to ask about. I have had friends from military families also, and I recognize common traits among them: they are reliable, punctual, and they don’t whine. Clements comes across readily as one of them. But he is a natural. He works hard, takes responsibility, and passes with flying colors, though the tale is told with a certain humility in which he owns his mistakes and laughs about some of them, lightening the overall tone. Long after bin Laden has been found and is dead, US forces continue to serve in the most maddening of conditions. Everything there seems to be in short supply. Nobody has a truck, and if they do, it runs badly; after all, trucks were designed for roads, not sand. Nobody can drive anywhere other than behind a minesweeper, because incendiary devices are planted anywhere and everywhere, or nearly so. Open desert is scary to cross because an attack could come from anywhere anytime, and just what will the convoy hide behind? But hills are worse, because gunners may hide behind them, and they too can conceal horizontal exploding devices. And while traveling in a large convoy, often speeds are limited to 3-5 miles per hour. Twilight is the Taliban’s favorite time to attack, but it is almost impossible to get anywhere at these speeds without having to travel during that time. If someone shoots at you, you aren’t allowed to shoot back unless you can see them; nothing creates an international incident faster than deaths due to friendly fire among allies. All you can do, when shots come out of nowhere, is run, and sometimes, that is at the speed of a walk. But it has to be done. The village must be secured. Clement has a gift for story, and the wisdom to let his experience gel to where he could write about what he did and saw with a measure of professional distance. He engages, but does not rant. It’s a good book, well paced and organized, with some (approved) photographs to further enlighten the reader. 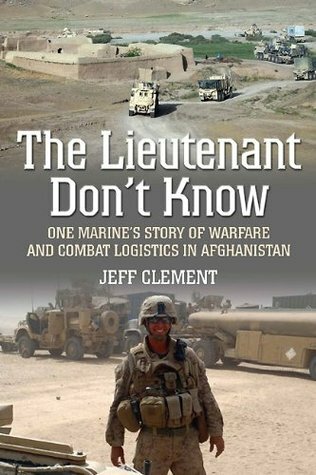 What is it that “The Lieutenant Don’t Know”? The phrase is mentioned early in the text, but not fully explained till the end of the book, and it is done with the care and precision of an accomplished writer. You’d better order a copy right now, because not just anyone can explain it the way Clement can. This entry was posted in memoirs and tagged Afghanistan, Marines, memoirs, military history-in-the-making, social justice by seattlebookmama. Bookmark the permalink.